Duke’s E-tank was invented by Arthur Duke of Georgia USA and patented in 1976 (US #3,951,787). Gold-separating devices classed as E-tanks include Duke’s E-tank, Graefe’s E-tank and Pyramid’s E-tank. Elutriated sludge tanks (E-tanks) is a term coined by the author for devices that inject water from below into a tank containing a bed of pay gravel that is quitethick (say >10 cm) to create a fairly stiff slurry just watery enough to stimulate gravitational settling of denseparticles and rising of low-density particles. The settledheavy concentrate can be a continuous discharge fromnear the base of the, orremains in the tank as a lag deposit to await batchdischarge. Unlike an E-tower, the E-tank’s contents remain asporridge-like slurry from top to bottom, and the slurry is not watery enough for classic ‘hindered settling regime. Instead the contents resemble a thixotropic quicksand. 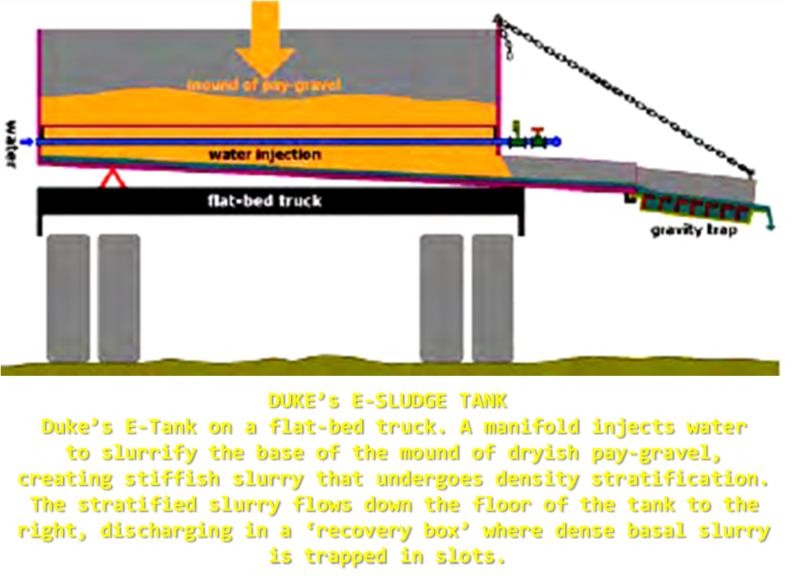 Unlike a jig, an E-tank contains slurry throughout. There is no jig screen, no ragging, no hutch chamber andslurry is not pulsed upwards (i.e. no jigging). The inventor claims the pay gravel need not be screened as block age by large stones are easily removed. Yet dry screening to reject >10-15cm over size would surely be advantageous; and the oversize could be fed into a conventional small wash-plant parked alongside. The inventor recommends a set of six units bemounted in parallel on a flat-bed truck, collectively able toprocess about 130m3/hour of loose pay gravel. Each unit has a rectangular hopper-shaped tank in which pay gravelis dumped by a conveyor, front-end loader, etc. The material should be dry or moist and should not be wettedby spray-bars. Water is injected into the base of the tank by means of a manifold of perforated water pipes, at apressure of 5-35psi but typically 5-10psi. Unlike a jig, E-tower or sluice, the water requirement is very low – eachtank is about a metre wide but a tank requires a mere 7.6m3 /hour of water to process about 22m3 /hour of loose pay gravel per hour. This is an order of magnitude less water than a Yukon-style sluice needs to process the samevolume of pay gravel. The pile of gravel in the tank cavitates from below due to contact with injected water. The slurrified basal gravel is free to stratify (dense material at the bottom) and creeps along the base of the tank tilted at about 12°. The slowly discharging sluggish porridge-like slurrytravels down a chute tilted at 15-35° and the dense lowermaterial is trapped by slots. According to the inventor,95% recovery is normal, and that recovered gold can beas small as 8μ! However no tests are published.